This high-spec MFP comes with a touchscreen control panel offering customizable apps to help you print, scan, and even translate documents at the machine. All this is impressive, but the device is costly and has limitations. 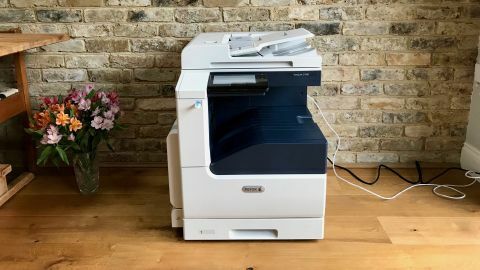 Xerox likes to boast that it’s ‘the company that created the modern workplace’ and we’re pleased to see that it is still innovating in the MFP category. We’re referring to the ConnectKey technology, which is a suite of connected functionality, fronted by a 7-inch touchscreen that offers up a smorgasbord of apps instead of a traditional menu. These apps make a variety of tasks almost as intuitive as if you were using a smartphone. Xerox recommends this VersaLink model to small and medium-sized businesses, but we think it has the features and capacity to meet the demands of larger offices – although for very high-volume printing, Xerox has the AltaLink range. With additional drawers, it can hold up to 5,140 sheets of paper, while Extra High Capacity toner cartridges can print up to 23,600 pages. Even in its most basic configuration, as seen here, this is a big unit, and weighing 92kg, it was a real struggle for two people to get it off the ground. We hoped it might sit on a desk, but it’s very much a freestanding design to which you can add from a very strong catalogue of accessories. That includes five different drawer units that ride on their own coasters and expand the paper capacity considerably. An A3 multifunction printer of this size was never going to look like anything but an eyesore in your office, but at least the off-white and petrol gray color scheme is unobtrusive, and it feels well-made. The plastic components are by no means flimsy and apparently there are fewer moving parts inside the latest models, so less chance of failure. The form factor looks familiar enough, with the scanner on top, paper trays to the side, top and bottom, and a paper-out tray at the centre. Where it differs from rival machines is the 7-inch tilting touchscreen display, but we’ll discuss that more in the next section. As you might expect of a multifunction printer costing £7,325 excluding VAT (around $9,750, AU$12,780), the VersaLink C7020 comes with every feature you can think of and a few more besides. The C7020 is positioned towards the top of the VersaLink product tree, and unlike the considerably more affordable VersaLink C405, it can accommodate A3 paper. A few essentials are included, like USB, which takes you to the options for whatever USB device you have inserted. More free and paid-for apps can be downloaded from the Xerox App gallery. Here you’ll find fun things like Xerox Easy Translator Service – an app that lets you scan in a page of foreign language text and print out the English translation. Just extracting this hefty piece of equipment from the box is a struggle, but once you’ve plugged in the power and Ethernet cables (no Wi-Fi module is included in the standard kit), getting started does not require a comprehensive background in IT. However, we did have some issues, which required long phone calls to a Xerox expert. The words ‘easy’ and ‘intuitive’ are used 47 times in the brochure and that’s misleading because this is the most complicated machine we’ve tested so far. There are so many parameters and settings that require manual checking before you can successfully print a file, it can feel as though the thing is just looking for excuses not to do what you want it to. However, between the helpful Xerox engineer, Google search and the 305-page user manual (yep, that’s just the English language section), we did achieve almost everything we set out to do. Installing the torpedo-like toner cartridges is straightforward and once you remove all of the transportation devices and configure all of the levers and flaps, there’s a setup wizard to get you get connected and printing. What it won’t do is automatically detect what kind of paper stock you are loading, so you need to confirm this both on the control panel and in your print settings. Also, it doesn’t always recognize which way around (portrait or landscape) you are loading the paper. The same is true when you place a document on the scanner. Adjusting the printer’s settings are also quite convoluted as only some can be accessed through the Devices app in the control panel. For example, modifying the time period before the machine switches from awake to standby is achieved within the printer’s web page menu. The quality and consistency of the VersaLink C7020’s printing, when it comes to black and white or color documents, is excellent. Text is particularly impressive when you reduce the point size to try and induce blocking or smudging. Colorful documents and maps also demonstrate its consistency in print quality, especially when you’re turning out A3-sized pages. It’s quite fast too, with color documents taking no longer than mono prints at 20 ppm (pages per minute). However, the time taken to power up from an off state is quite long at over 90 seconds. Printing photos on photo paper is not a strong suit. There’s no setting for Glossy Photo Paper, although you can choose Glossy Cardstock, but even at optimum quality, photos look unnatural and somewhat mottled. Photo paper tends to emerge quite curled. High capacity toner cartridges ensure your business keeps printing without having to stop for a refill, while the per-page cost comes down to less than one penny per page for black and white printing. We experienced two paper jams during the test period and noticed some creasing of plain paper, although this stopped happening after a few days. Also, we found that the front USB port could only read certain files from an HDD, or flash drive. For example, it can recognize PDF, JPG, TIFF and XPS, but not MS Office files, Scrivener, or Apple Pages documents. Scanning is fast, accurate and fairly high quality. We didn’t manage to send emails to an iCloud address, or a folder on a MacBook running High Sierra, but PC users will have no such problems. This is a premium multifunction printer and that’s evident in the build quality, print quality and the wealth of features. If your business has a busy print schedule, the VersaLink C7020 will be up to the task and has the potential to expand through its accessories. Smaller offices will be put off by the size and cost of this MFP, and should consider a simpler (and cheaper) solution.